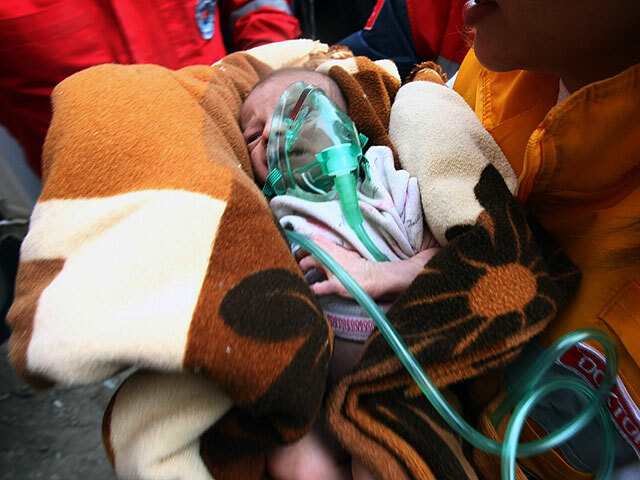 ERCIS, Turkey - After 48 hours, a miracle emerged from a narrow slit in rubble of a Turkish apartment building: a 2-week-old baby girl, half-naked but still breathing. Stoic rescue workers erupted in cheers and applause at her arrival  and later for her mother's and grandmother's rescues  happy news on otherwise grim day when the death toll from Sunday's earthquake climbed to at least 432 and desperate survivors fought over aid. The fact that three generations were saved in a dramatic operation was all the more remarkable because the infant, Azra Karaduman - her first name means desert flower in Turkish, reports CBS News correspondent Mark Phillips - was later declared healthy after being flown to a hospital in Ankara, the Turkish capital. Television footage showed rescuer Kadir Direk in an orange jumpsuit wriggling into a pile of concrete and metal  what was left from a five-story apartment block  and then wriggling out with Azra, clad only in a T-shirt. Praise be!" someone shouted. "Get out of the way!" another person yelled as the aid team and bystanders cleared a path to a waiting ambulance. In a separate rescue later Tuesday, 10-year-old Serhat Gur was pulled from the rubble of another building after being trapped for 54 hours. He was wrapped in a blanket and taken to an ambulance on a stretcher, Turkish television showed. The pockets of jubilation were tempered by many more discoveries of bodies by thousands of aid workers in the worst-hit city of Ercis and other communities in eastern Turkey struck by the 7.2-magnitude earthquake. Some 2,000 buildings collapsed, but the fact that the tremor hit in daytime, when many people were out of their homes, averted an even worse disaster. Close to 500 aftershocks have since rattled the area, according to Turkey's Kandilli seismology center, and a moderately strong one measuring 5.4-magnitude sent residents rushing into the streets in panic Tuesday. There was still no power or running water and aid distribution was disrupted as people stopped trucks even before they entered Ercis, grabbing tents and other supplies. Kanal D television showed people fighting over tents and blankets in some areas. Aid workers said they were able to find emergency housing for only about half the thousands of people who needed it. Most of the damage was in Ercis, but many buildings were also damaged in the provincial capital, Van, about 55 miles to the south. Authorities have warned survivors in the mainly Kurdish area not to enter damaged buildings and thousands were preparing to spend a third night outdoors, in cars or tents. Temperatures at night have been close to freezing. Some 1,300 people were injured in the quake. At least nine people were rescued on Tuesday, although many more bodies were discovered.